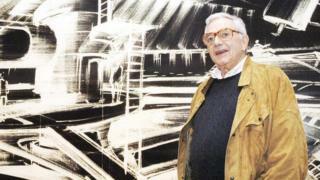 Production designer Sir Ken Adam, famous for his work on Dr Strangelove and seven James Bond films, has died at the age of 95. He died on Thursday at his home in London after a short time in hospital. Sir Ken's famous sets include the triangular Pentagon War Room in Dr Strangelove and the villain's headquarters in the 1962 James Bond film Dr No. He also designed the car in Chitty Chitty Bang Bang. He became widely regarded as British cinema's doyen of production design, his credits including most of the James Bond films up to Moonraker (1979). Sir Ken's death was confirmed by Sir Christopher Frayling, his biographer, who told the BBC: "As a person he was remarkable. Roger Moore once said about him that his life was a great deal more interesting than most of the films that he designed. "He was a brilliant visualiser of worlds we will never be able to visit ourselves - the War Room under the Pentagon in Dr Strangelove, the interior of Fort Knox in Goldfinger - all sorts of interiors which, as members of the public, we are never going to get to see, but he created an image of them that was more real than real itself." Sir Roger Moore hailed Sir Ken as a "visionary", writing on Twitter: "Sir Ken Adam - a friend, a visionary and the man who defined the look of the James Bond films." A tweet from the James Bond Twitter account read: "The Bond family mourns the passing of our beloved friend Sir Ken Adam who was so responsible for the visual style of the James Bond films." Sir Ken was born Klaus Adam in 1921 in Berlin. His Jewish family, who ran a sports store, fled the Nazis to England when he was in his teens. He began to study architecture, and later served in the RAF - one of the few members of the RAF with a German passport. After the war, he worked on Around the World in 80 Days, coming to the attention of producer Albert "Cubby" Broccoli who went on to hire him for The Trials of Oscar Wilde and, in 1962, Sir Ken's first Bond film, Dr No. Sir Ken's career lasted into his 70s, and he worked on more than 70 films, including seven in the Bond franchise. He won two Oscars, in 1976 for his work on Stanley Kubrick's Barry Lyndon; and in 1995 for The Madness of King George. He was also Oscar-nominated for his work on Around the World in 80 Days, The Spy Who Loved Me and Addams Family Values. Sir Ken told the BBC that "as a production designer, you have the possibility of, I don't want to say fooling the audience, but of offering a form of escapism, which is very often more exciting that reality." He added that, when working on the Bond films, he had to deal with the fact that "none of the locations [Ian Fleming] described existed". The backdrops and props he created for the Bond films included Blofeld's volcano hideaway in You Only Live Twice - a set which reportedly cost more than the entire production budget of Dr No. Sir Ken told the Los Angeles Times last year: "`One critic asked, 'How did you ever get inside the volcano?'. His work for Stanley Kubrick's Dr Strangelove, included the best movie-set ever built, according to Steven Spielberg. Sir Christopher said: "It is said that when Ronald Reagan first became president, he visited Washington and asked one of his aides to see the War Room under the Pentagon, and the aide said: 'Mr President, there isn't one.'" Sir Ken told the BBC in 2013 that he and Kubrick "got on like a house on fire" - but that the process had been exhausting. "I was incredibly close with him," said Sir Ken. "It was almost like an unhealthy love affair between us. And I had a breakdown eventually." In 2003, Ken Adam received a knighthood - the first for a film production designer. He is survived by his wife Maria Letizia, whom he married in 1952.